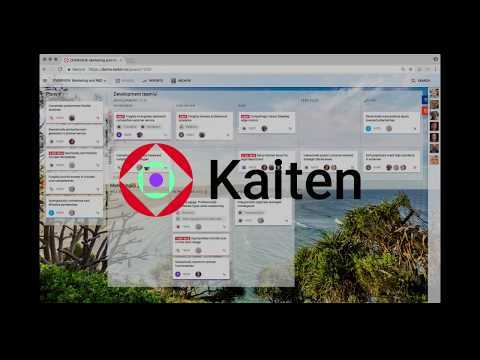 Kaiten is a cloud-based visual project management solution powered by Kanban which enables collaboration between multiple teams within a company. Business flows are displayed on a single screen, with users able to combine multiple task boards in a single workspace. Various flows, including business and technical flows, can be created through the summary board, and users can define custom card types, set due dates, create task checklists, and more. Related cards can be linked together, and any process blocks are displayed visually. Files can be uploaded to the platform, and users can add comments and tags to manage cards. It was a pleasant experience for the whole team to use Kaiten on 2 recent projects. Fast and easy organization of Agile software development process.- It's easy to use. - Overall user experience is much more pleasant compared to Trello or Jira, that we also have to use sometimes. - The main view with boards and cards is informative thanks to custom card types, task type badges and tags. - Boards are highly customizable. - There are various card linking features. - Customer support is really responsive. They try to make a product better. Feature requests are NOT silently ignored as it happens sometimes with other software products. - It's easy to use. - Overall user experience is much more pleasant compared to Trello or Jira, that we also have to use sometimes. - The main view with boards and cards is informative thanks to custom card types, task type badges and tags. - Boards are highly customizable. - There are various card linking features. - Customer support is really responsive. They try to make a product better. Feature requests are NOT silently ignored as it happens sometimes with other software products. There's nothing, that I would say I dislike, but more of wish. - They already added GitHub integration, but I'd like to see more integration possibilities, so that it can be integrated with CI/CD pipelines and Test Management tools as is the case for Jira. - In general I would say, that it's more Scrum Master, Product Owner oriented, that Developer-oriented. I'd like to see more neat features for Developers in the future, like integrations and REST APIs. - Improve support for touch screens. I like lanes, limits, blocking option. I really fond of creating checklists that could be automatically added when you move a card and templates for card description. Simple, easy-to-start interface. Great collaboration options. Kanban boards and charts provide possibilities to make successful decisions We used Kaiten for plan marketing activities for our clients and it was very useful. To "grey", boring interface. It become much prettier when they add background images. Some charts are not very simple understand. I moved to Kaiten from Jira and liked it from the first view, because it reduced my daily routine and time spent on tasks management and control. I like using Kaiten because it is simple and helps me to solve my operational tasks. I like using Kaiten because it is simple and helps me to solve my operational tasks. Standard cloud: $7/user/month (billed annually) or $9/user/month (billed monthly). Private cloud: $20/user/month (billed annually) or $25/user/month (billed monthly). A free plan is also available for startups, nonprofits, and public usage. The workspace allows users to create multiple boards and assign user permissions to control access. Through the summary board, users can create a range of flows, including business and technical flows. Blocks are displayed visually, giving users insight into why cards are not moving forward. Users can define custom card types, assign types to each card, and add due dates to cards which have fixed deadlines. Files can be uploaded to Kaiten, or users can link to files stored in Dropbox or Google Drive. Below are some frequently asked questions for Kaiten. Q. What type of pricing plans does Kaiten offer? Q. Who are the typical users of Kaiten? Q. What languages does Kaiten support? Q. Does Kaiten support mobile devices? Q. Does Kaiten offer an API? Yes, Kaiten has an API available for use. Q. What other apps does Kaiten integrate with? Q. What level of support does Kaiten offer?